The start of another Hyperion Lieder series is always cause for celebration. In advance of his bicentenary in 2011, we turn to a composer whose songs, against the vast bulk of his compositions in larger genres, were considered insignificant for well over a century. A collaborator with some of Europe’s best singers, such as the great French tenor Adolphe Nourrit and the husband–wife duo of Feodor and Rosa von Milde (the first Elsa and Telramund in Wagner’s Lohengrin), Liszt used song as a compositional laboratory in which to experiment with ‘Zukunftsmusik’, or ‘music of the future’, including some of his most finely wrought works. A cosmopolitan artist who traveled prodigiously during his years as a virtuoso performer from 1838 to 1847, he chose song texts written both by denizens of Mount Olympus (Goethe, Schiller, Heine, Hugo, Tennyson, Tolstoy, Petrarch) and amateurs, the latter often aristocrats from Liszt’s glittering social circles. From their words he created songs that changed the very definition of the genre, that are a bridge to such later masters as Hugo Wolf, Sergei Rachmaninov and Richard Strauss. 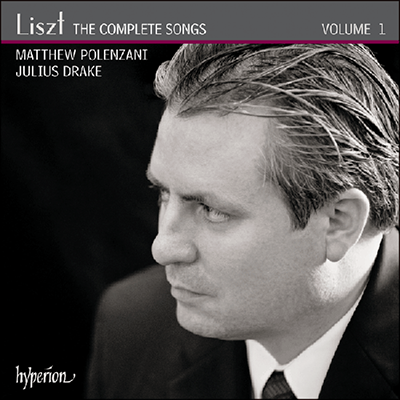 This first volume in the series features the American tenor Matthew Polenzani who has been astounding Met opera audiences in recent years with his expressive and ardent performances. He is accompanied by the curator of the series and Hyperion regular, Julius Drake.